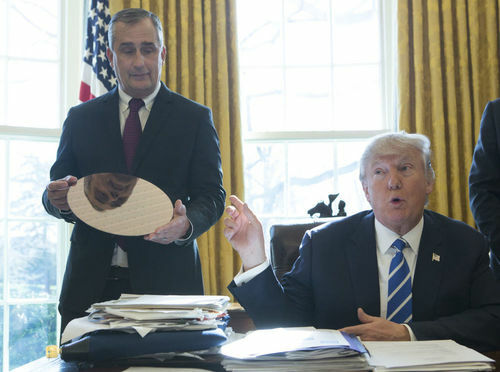 Brian Krzanich, the CEO of Intel, announced this morning he was resigning from President Donald Trump's American Manufacturing Council. He is the third chief executive after Under Armour's Kevin Plank and Merck's Kenneth Frazier to quit the council in less than one day. 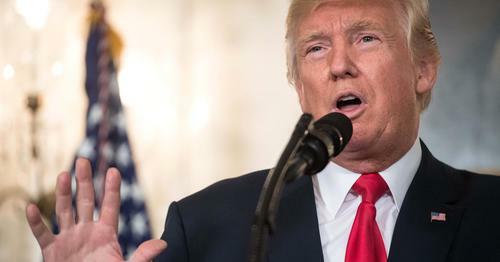 The executives resigned in reaction to President Trump’s response to the violent incidents at the weekend in Charlottesville, Virginia, which included a rally of white supremacists. I have already made clear my abhorrence at the recent hate-spawned violence in Charlottesville, and earlier today I called on all leaders to condemn the white supremacists and their ilk who marched and committed violence. I resigned because I want to make progress, while many in Washington seem more concerned with attacking anyone who disagrees with them. We should honor – not attack – those who have stood up for equality and other cherished American values. I hope this will change, and I remain willing to serve when it does. America's C-suite reacts to Charlottesville. The CEO of Intel becomes the third executive to leave President Trump's Manufacturing council, after the bosses of Merck and Under Armour head for the door. The Genie is out of the SEC bottle! 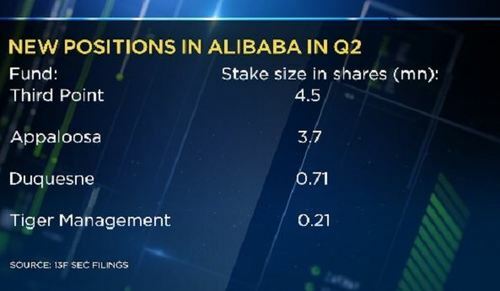 13-F filings show Alibaba is the darling of the hedge funds in the second quarter, as the likes of David Tepper, Dan Loeb and Stanley Druckenmiller pile into the Chinese e-commerce giant. Brexit papers to be published today reveal the U.K. government is seeking a temporary customs deal with the EU, in what is seen as a victory for advocates of a smooth transition. 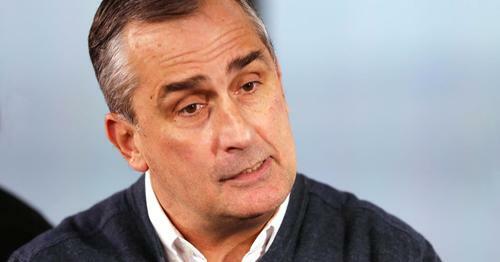 Intel's Brian Krzanich and Under Armour Founder Kevin Plank are the latest CEOs to step down from President Donald Trump's American Manufacturing Council. Three CEOs have now dropped out after President Trump initially failed to single out white nationalists when condemning the violence in Virginia over the weekend. 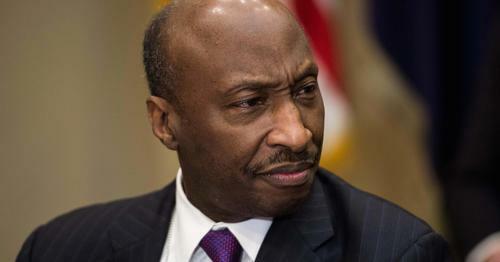 Kenneth Frazier, CEO of Merck, said as he was leaving the council that "America's leaders must honour our fundamental values by clearly rejecting expressions of hatred, bigotry and group supremacy." 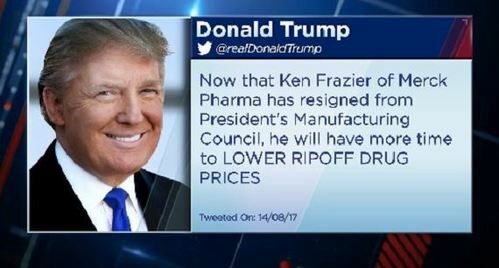 President Trump slammed the statement, tweeting that the Merck CEO should now have more time to work on reducing "ripoff drug prices". NBC's Hallie Jackson has the latest on the controversy that sparked the CEO resignations. CNBC has reached out to all the CEOs who remain on Trump's Manufacturing Council. Click below to read their thoughts on the president's handling of the violence in Charlottesville Virginia. Presidential council executives have begun an exodus, with CEOs of Intel and Under Armour following Merck CEO Ken Frazier's decision to quit. North Korea says now is not the right time to discuss detained Americans with the United States. That's according to KCNA citing the foreign ministry. This news comes as North Korea backs down from its rhetoric on Guam. North Korean state media reported Kim Jong Un has delayed a decision on firing missiles towards the U.S. territory of Guam while he watches the actions of the United States a little longer, as Washington warned it would take out any missile heading for the Pacific island, according to Reuters. Big hedge funds are pouring money into Alibaba. According to the latest 13F filings, four hedge funds, including Dan Loeb's Third Point, built new stakes in the Chinese e-commerce firm in the second quarter. Loeb added 4.5 million shares of Alibaba, while David Tepper's Appaloosa Management added 3.7 million. Alibaba shares are up over 70 percent so far in 2017. The company will report earnings on Thursday. North Korea has put on hold its plan to launch a missile toward Guam. According to state media, Kim Jong Un plans to watch U.S. actions before taking a decision. Asian shares and the dollar strengthened in the wake of the news. Alison Evans , deputy head of Asia-Pacific at IHS Markit, says a major problem in the political situation is the Trump administration has essential said that China has complete control over North Korea and needs to do more, while China insists it does not have much control. Personally I think they do have some leeway to implement the sanctions much more strictly and they have announced yesterday that that’s what they’ll start to do with the new U.N. sanctions last week. 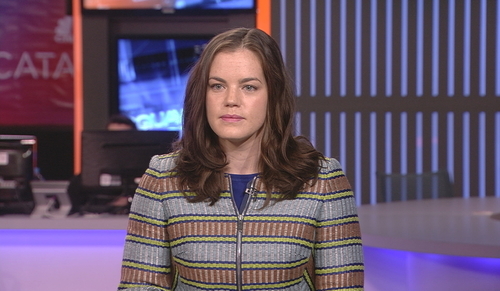 Evans says the sanctions would put substantial pressure on North Korea, but the country has a history of getting around sanctions through illicit means. Spanish bank Santander has been removed from Goldman Sachs pan-European buy list. Goldman Sachs has cut its rating on Santander to neutral. 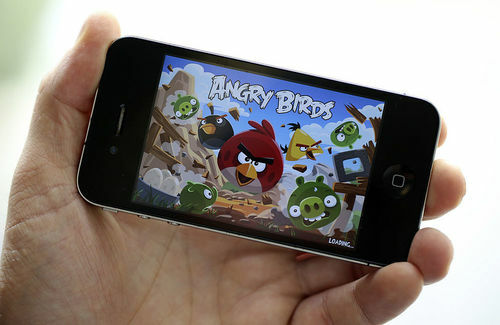 "Angry Birds" develop Rovio Entertainment reports H1 sales increased to 152.6 million euros from 78.5 million a year before. The numbers were boosted by movie revenue after the release of a feature-length film last year. The video game makers post H1 adjusted EBITDA at 41.8 million euros versus 11 million a year earlier. K+S reports Q2 sales of 742 million euros and EBIT of 29 million euros. net profit was 18.9 million euros. The German firm missed analyst expectations of 761 million euro revenue and 31.3 million euro EBIT. The company admitted it is unlikely to reach its 2020 profit target due to weak prices. It said its previous forecast was based on higher price of $330 per tonne of potassium chloride. U.S. President Donald Trump has targeted China in a fresh trade probe. He has signed a memorandum, which could trigger an investigation into China's alleged theft of intellectual property, violating international trade laws. Speaking in the White House after signing the memo, which was delayed by more than a week, President Trump said this was just the beginning. The U.K. is seeking to clinch an interim trade deal with the EU after Brexit. Government documents show Britain will propose a temporary customs union to reduce friction and provide certainty for businesses. But the country also wants the right to negotiate other trade deals, which could be a sticking point in the divorce talks. Wolfgang Schaeuble says the European Central Bank's ultra-loose monetary policy will come to an end in the foreseeable future. Speaking at a campaign rally, the German finance minister repeated criticism that interest rates were too low, but added there were signs that the low rate environment "is gradually getting better". Schaeuble also said the ECB needed to be careful when tightening. Meanwhile, New York Fed President William Dudley says he favours another rate rise this year. In an interview with the Associated Press, Dudley said if the economy evolves as forecast, the Fed should hike rates again later this year and soon begin unwinding some of its bond holdings. The New York Fed President also praised the Trump administration for being "hands-off" with the U.S. central bank and for 'not politicizing monetary policy'. German Chancellor Angela Merkel's Conservative party is on 37 percent support, while rival party the Social Democrats are on 25 percent support, according to the latest INSA poll of voting intentions. The flash reading of German seasonally adjusted Q2 GDP is 0.6 percent quarter over quarter, a tad under expectations of 0.7 percent, according to the statistics office. The unadjusted GDP is up 0.8 percent year on year, missing forecasts of 1.9 percent. Apple and Aetna have held secret talks about possibly providing the Apple Watch to the insurance company's clients. Aetna already offers the wearable technology to its employees, but is considering extending the offer, as part of a push to increase consumer interest in healthier lifestyles. Apple Watch recently overtook Fitbit as the top selling wearable tracker. 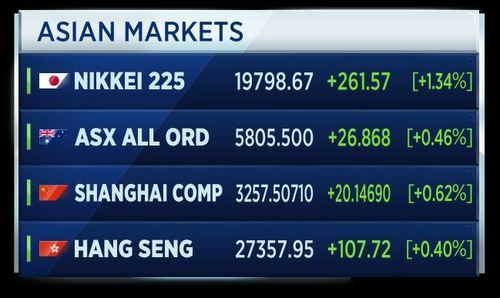 Asian stocks follow Wall Street higher, getting a boost after North Korea says it will wait and see what the US does next, before making a decision on firing missiles towards Guam. Brexit papers to be published today reveal the UK government is seeking a temporary customs deal with the EU, in what is seen as a victory for advocates of a smooth transition. Finland's Q2 GDP shrunk 0.5 percent quarter over quarter. GDP fell 0.5 percent year over year as well. 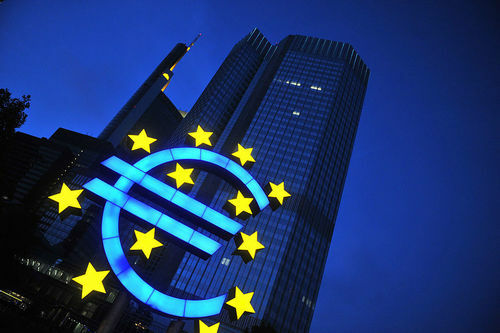 The June current account deficit was 0.3 billion euros. Hargreaves Lansdown adds £6.9 billion in new business for the year ended June 30. The asset manager declares a total dividend of 29 pence per share. Full year net profit was £211.7 million on revenue of £385.7 million. The U.K. competition regulator CMA is considering proposals to overcome its concerns regarding Wood Group's purchase of Amec Foster Wheeler. The oil and gas engineering service companies have offered to sell off almost all of Amec Foster Wheeler's assets which contribute to its upstream offshore oil and gas business in the U.K.
CMA says it believes these proposals could satisfy its concerns and will now undertake a public consultation. The CMA has until October 12 to consider whether to accept the offer, with the possibility of extending the deadline to December 7 in special circumstances. Britain's Brexit minister David Davis says the U.K. will probably not have to pay to have customs union in an interim period after Brexit, according to Reuters. Davis says Brexit negotiations are going fine. He says there is likely to be lots and lots of turbulence during Brexit talks. He says it will be tough but the U.K. can get the right deal on Brexit. German bund futures opened 26 ticks lower at 163.94 today, after GDP data missed expectations in the second quarter. Q2 GDp came in at 0.6 percent quarter over quarter, under expectations of 0.7 percent. Year on year the figure was 0.8 percent against an expected 1.9 percent. The Federal Statistics Office reports net trade dampened the economy's expansion. Growth was driven by strong household spending and rising state expenditure. 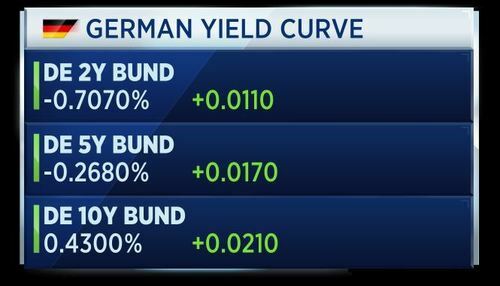 Yields on German debt is up by around 1 to 2 basis points along the curve. Yields move inversely to prices. Here's the yield curve at 07:35 a.m. BST. ECB President Mario Draghi is likely to be cautious at Jackson Hole later this month, says Thomas Harr, global head of FICC strategy at Danske Bank. He's going to not sound too confident about the economy because then he risks that rapid rise in euro is just going to continue and we have to remember the challenge he faces is the euro is rising for good economic reasons: the currency is undervalued as Europe is running a massive current account surplus. European markets are called to open slightly higher on easing tension between the U.S. and North Korea. 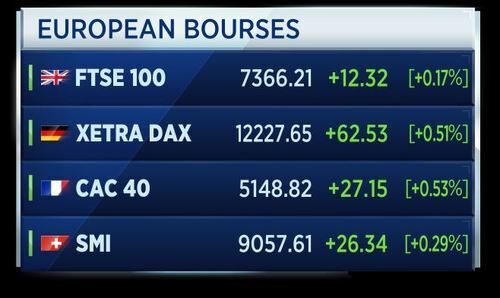 European markets are now open for trade, with the Stoxx 600 moving to the upside at the start of Tuesday's session. Denmark's GDP rose 0.5 percent in the second quarter. 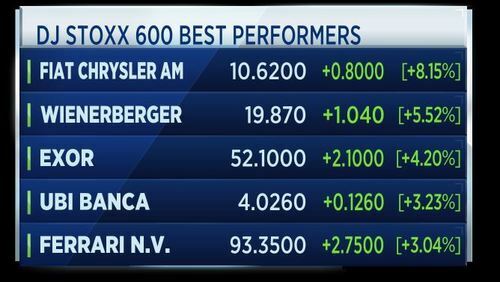 Here's how the major individual European markets are performing this morning. Markets in Poland, Austria, Greece and Italy are closed today. Gains in the Stoxx 600 are broad based this morning. 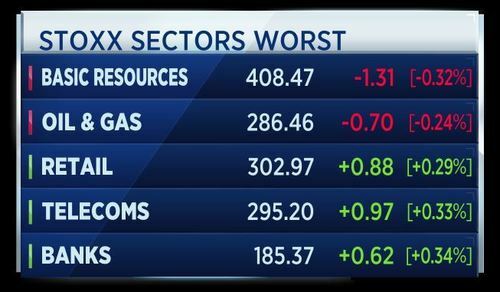 Only the basic resources and oil & gas sectors are negative. The food & beverages sector is leading the market higher. This after reports that activist fund Corvex management now owns a share in the food company worth around $400 million. 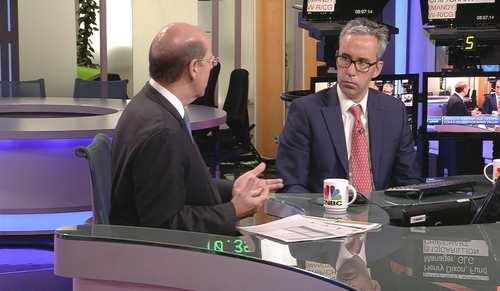 Ian Harnett, Chief Investment Strategist at Absolute Strategy has joined our guest host Henry Dixon, Fund Manager at GLG to discuss market strategy. I think now some of those earnings and growth earnings expectations are too high and we would expect single digit earnings growth. On UK earnings expectations, Harnett says they are "grossly overvalued". K+S is warning it may not reach its medium-term earnings targets. The German group warned that its goals for 2020 could be difficult to reach, due to the slow recovery of potash prices. K+S also saw second quarter operating profit miss expectations. Hargreaves Lansdown has reported a 21 percent rise in profits. However its total dividend has fallen 15 percent from a year ago after it increased its capital buffers. The investment management product provider added 6 point 9 billion poinds in net new business for the year. Sainsbury's has shelved plans to takeover convenience chain Nisa over competitions concerns. It follows increased concerns about how the Competition and Markets Authority is assessing Tesco's swoop on Booker. Sources say that Sainsbury's paused talks until it better understands how the CMA would review any deal. Sainsbury's hesitance has seen Co-op return to the bidding process. Britain's competition and markets authority says Amec Foster Wheeler's proposed asset sale could be enough to gain regulatory approval for its merger with John Wood Group. Amec has plans to sell almost all of its upstream oil and gas servicing assets. John Wood agreed to buy the company for 2 point 2 billion pounds earlier this year. Swiss producer/import prices are unchanged month on month and down 0.1 percent year on year in July, versus a change of 0.1 percent month over month and year on year in June. Something like 60 percent percent of Italian BB corporate paper are trading lower than US Treasury's. That seems strange to me. 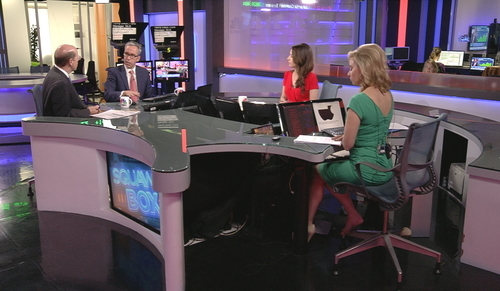 Henry Dixon, Fund Manager at GLG says there is some "unbelievably curious" data points in the credit market and this is the asset class where any market wobble is likely to start. Absolute Strategy's Harnett adds that any "taper tantrum" could come if the ECB and the Fed both act too quickly in their bid to normalize interest rates. Ian Harnett (L) addresses a question from guest host Henry Dixon. China's foreign ministry reiterates its call for restraint on the Korean peninsula. The ministry says a peaceful resolution on the peninsula accords with the interests of all sides. The ministry hopes all sides can put out the flames of conflict, and not add oil to the fire with words and actions. Britain's Brexit minister David Davis says a temporary customs union would be as close as we can get to current arrangements, according to Reuters reports. Davis says the U.K. will have a new customs system ready a few months before leaving the EU. He says it is very hard to say how long the Brexit transition will be, most likely 2 years, but it must be done by the next U.K. election. We don't think that there will be a tax adjustment or that growth will accelerate but the U.S. remains the largest of defensive markets. Ian Harnett makes the case for why the U.S. may remain an investment favorite despite whatever does or doesn't happen in Washington. 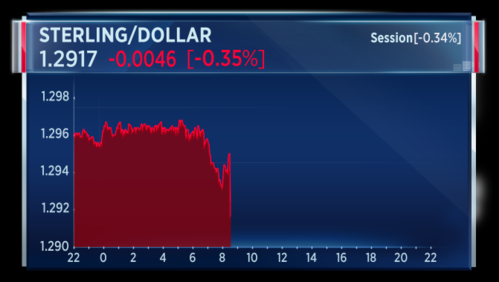 Harnett also makes the claim that the U.S. dollar is set to depreciate about 30 percent over the next 3 to 5 years. He says longer term that will provide an opportunity for emerging markets. Is the dollar set to fall further? 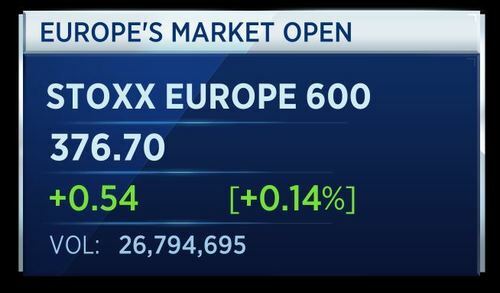 The Stoxx 600 remains up around 0.3 percent half an hour into Tuesday trade. 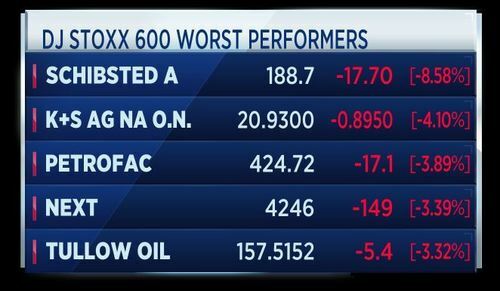 These are the best and worst stocks on the index. German firm K+S is far down the index followings its disappointing results and weaker outlook for the midterm. 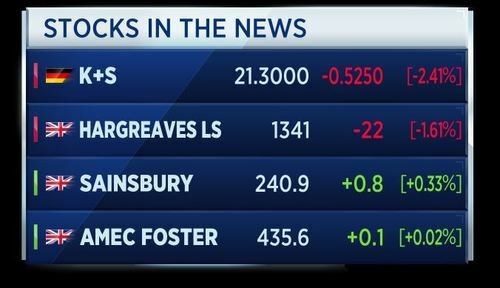 As we continue into the trading day here's a reminder of our top TV headlines this Tuesday morning:. 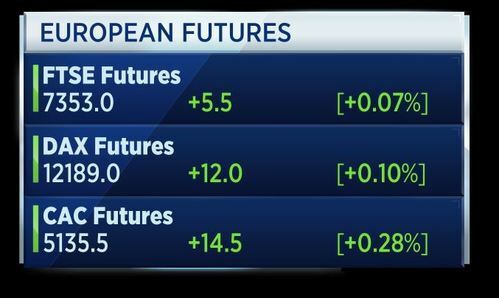 European equities follow Asia and Wall Street higher, as North Korea says it will 'wait and see' before making a decision on firing missiles toward Guam. Danone shares rise to the top of the Stoxx 600, amid reports of activist hedge fund Corvex Management having a $400 million stake in the French food company. CNBCThe executive has tendered his resignation from the American Manufacturing Council, the company announced in a blog post late on Monday. 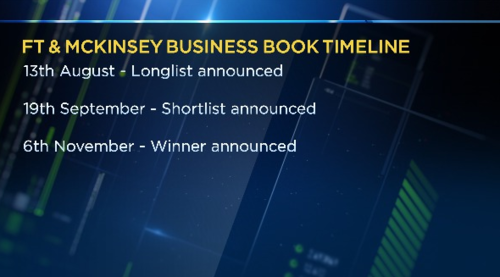 The Financial Times and McKinsey have released the "Longlist" for the 2017 Business Book of the Year Award. The rise of Uber and the economic impact of catastrophes are some of the themes explored by the books on the list. Among the authors are Microsoft Chief Executive Satya Nadella and Nobel Prize winner Jean Tirole. Andrew Hill, Management Editor at Financial Times says tech is dominating the list with both those that celebrate tech and those that a re questioning dominant positions enjoyed by the likes of Amazon, Google and Facebook. 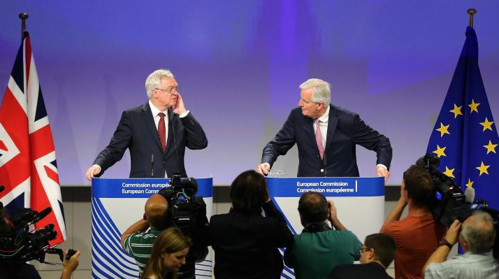 Britain's Brexit minister David Davis has said that his department is not in chaos. EU officials have previously been quoted as saying the British stance looks too confused to be true, so it must be part of an elaborate bluff. He says Brexit will be good for Britain but admits that the EU negotiator is getting quite cross with the UK over the bill that Britain would have to pay to leave the union. David has said he does not expect a final amount to be resolved by October. Britain is currently scheduled to leave the European Union by March 2019. London's transport operator TFL says Holborn underground station closed as they respond to a fire alert. Reaction is hitting social media. The British fire service says it has sent two fire engines to investigate reports of smoke. UK inflation for July has come in at -0.1 percent month-on-month with a year-on-year figure of +2.6 percent. Both of these are 10 basis points below the estimate. Digging slightly into the detail it seems upward pressure from food, clothing and household goods was offset by falling fuel prices. 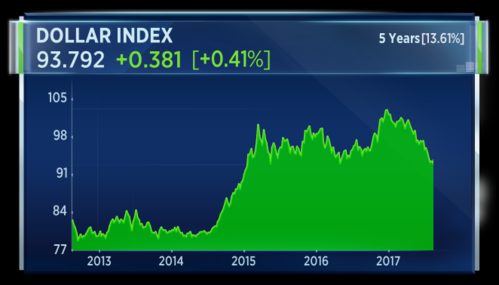 On set, Gerard Lyons, Chief Economic Strategist at Netwealth says this data set shows that a lower pound is starting to have an effect on the economy. He says this will take pressure off the Bank of England and we can now expect rates to stay lower for longer.